Luton boss Nathan Jones questioned the desire on show from some of his players after they were beaten 2-1 by Peterborough United in the Checkatrade Trophy last night. As in the league contest at the ABAX Stadium, the Hatters paid the price for a poor first half display, trailing 2-0 at the break. Although Jones made nine changes, including handing a full debut to right back Jack James, he had expected better from the side he selected, saying: “We want to use the squad and we want to test people, people like Jack James, people like Arthur Read, people like (Aaron) Jarvis, we’ve got decisions on them. “Whether they’re ready for the first team, that if there’s injuries, can we put them in? Are they ready for that kind of thing? “So I’ve learned a lot about that, as a few of those young lads, we think highly of them, but they have to be tested. “This is a good cauldron, Peterborough made a few changes to be fair, obviously they were slightly older than we were, but that’s what we’ve had to do. “But I’m just disappointed all round, as even if you’re slightly inexperienced, if you run around and go and press people, we didn’t really do that. “Whether it was because they were caught out structurally, I don’t know, but there wasn’t that desire really. Town had gone into the game already secure in their position as group winners, and when asked if he felt that was a factor in their tame first half display, Jones continued: “It shouldn’t have been because we want to continue the unbeaten run and we want to do well, but we played like that first half. “We played like a team that had already qualified and were looking to go through the motions. “That wasn’t us and that’s the disappointing thing, as a few out there want to get in the first team, and I learned a lot as we’ve set really high standards. The Hatters were much improved after the break though, with Harry Cornick and Alan Sheehan both missing excellent chances, before Matty Pearson gave them a lifeline when his cross was fumbled in by keeper Conor O’Malley. Cornick was closest to a leveller, denied by the home stopper, but Jones said: “We had opportunities, Harry Cornick has got in two or three times, their keeper’s had to make saves, better saves than the one he dropped one in. 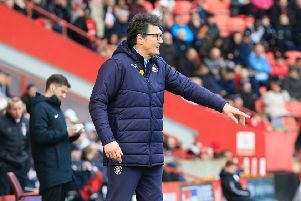 “If we had more of a clinical edge, we might have got something out of the game, but the first half performance, when you go 2-0 down, and they are poor goals, the performance levels didn’t merit any more. Unlike recent matches in the competition, Jones named an exceptionally strong bench, with only Josh Neufville from the U18s present, Jack Stacey, Pelly-Ruddock Mpanzu and Sonny Bradley all included on it. On why that was the case, with progression already secured, he added: “It’s a training week, it’s about preparing for Saturday as well. “Because of the injuries we have, we’ve probably left seven or eight at home, so we needed to get everyone ready for Saturday. “Those who were brought here could play a part or did a certain training session before the game, so it was all about physicality in terms of going into the weekend.